The St. Cloud Technical and Community College (SCTCC) Practical Nursing program is approved by the Minnesota Board of Nursing. The Practical Nursing Program is designed to provide learning opportunities in various settings where students work closely with physicians, registered nurses and other health care professionals in the delivery of delegated medical care and skills. In addition, assistance is provided to individuals to meet their basic human needs. The program stresses meeting basic needs within the framework of normal growth and development throughout the life span. Learning experiences are developed utilizing the nursing process as a framework for training the practical nursing student. Emphasis is placed on safe practice and the role of the Licensed Practical Nurse. Past experience, the study of sciences, and personal initiative are all considered important for success in this program. The program is fully approved by the Minnesota Board of Nursing. The Practical Nursing Program provides a foundation for career mobility with associate or baccalaureate professional nursing programs. I like the idea of getting a nursing degree in steps. It was a little daunting to go to a 4-year and get everything done at once. Here you can do it in steps and work as you go. 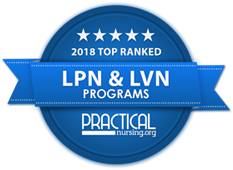 The SCTCC Practical Nursing program has been named the third-best PN program in the state of Minnesota in 2018 by practicalnursing.org. Colleges were ranked based on the NCLEX-PN pass rates in the past five years. The NCLEX, or National Council Licensure Examination, is the exam practical nursing students take to become a licensed practical nurse. 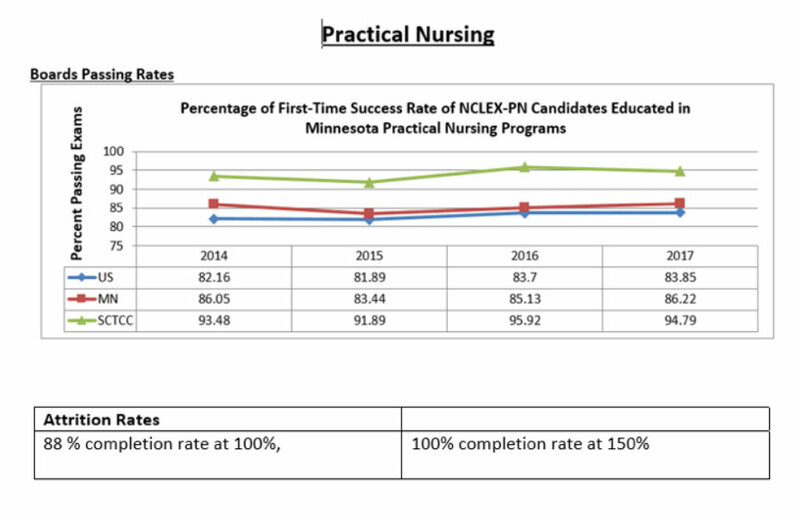 According to MN DEED, the projected growth rate between 2012 and 2022, for License Practical Nurses in Minnesota, is 18.6%. According to MN DEED (2015), the median wage for License Practical Nurse is $20.36 per hour. Pre-Practical Nursing students can contact the Academic Advising Center. Effective Fall 2015, the Part-Time Practical Nursing Program will be offered every semester. The part-time program will accept 8 students every semester instead of 25 students every two years. This part-time program is designed for students who are interested in becoming PNs but need a part-time credit load. Part-time courses will be integrated with the full-time courses. Part-time students will take their courses with the full-time students but will maintain part time credits. The part-time program is designed to be completed over 4 semester. Courses will be offered primarily days. Clinical course hours will vary depending on clinical site availability. This will be a continuous program. If a student needs to leave the part-time program, they will need to wait until the next cohort begins. The PN program strives to provide quality, consistent learning opportunities to both the full-time and part-time students. The integration of full-time and part-time students together will provide this opportunity.